We urge club experts and A players to make this year's 5 round Swiss another very competitive tournament. 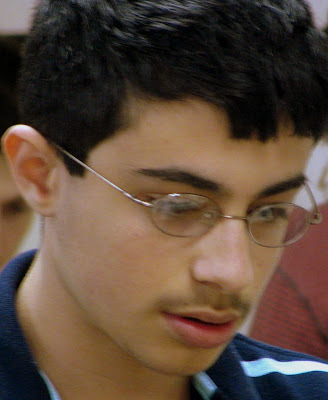 Dr. Jon Lee and 15 year old Adam Yeddia, winners of the first part of the cycle - the Weaver Adams Under 1800 Championship, were seeded into the Reubens Landey by virtue of their victories. 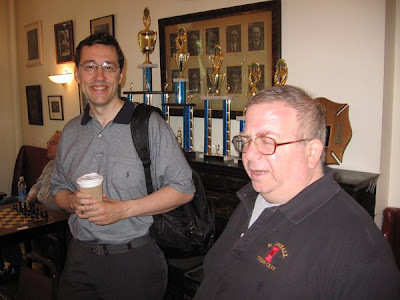 FM Paul MacIntyre and NM Chris Williams of the Boylston Club played in the very strong New York International at the historic Marshall Chess Club. 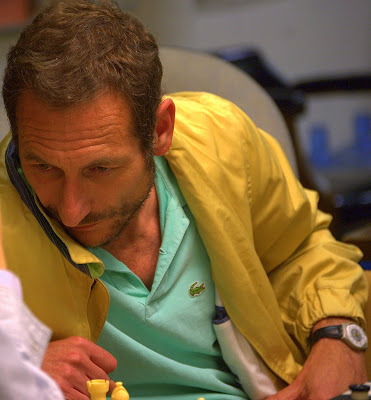 Paul finished with 5 points in the 9 round Swiss, including a draw with IM Jay Bonin pictured here in the photo by Larry Price. Chris Williams scored 3 1/2. Chris Bird posted a nice bunch of photos from the event as well. tied for first with 3.5 points winning U1800 BCC Championship. Meanwhile Adam Yedidia out maneuvered Mike Griffin in a strategic French battle to win in round four catching up to Lee. The usual band of WA contestant's Ed Foye, Bob Oresick, Tony Cortizas, Ted Gorczyca were complemented with the addition of Seth Lieberman, Nicholas Lesieur, Tom Pendergast, along with the very solid Khikmet Sadykov. The new Weaver Adam's trophy was unveiled and presented by director Mike Griffin playing "Take me out to the ballgame" by blowing into said trophy. The trophy will be retired to the WA trophy archive with Jonathan and Adam's names attached as the 2008 winners. Jonathan and Adam will move up having free entry into the Reubens/Landey BCC Qualifier U2200 Championship beginning 7/7. We wish them great success. Where did chess begin? For many who play the sport at its highest, most obsessive levels, that's not just a question of history — it's a matter of ownership, of dominion. We're so completely lost in our universe of 64 black and white squares that we like to think every move we make changes the way the world exists. So it's easy for Russians to imagine that chess began when they started to play it. In 1991, at my first international tournament, in Reggio Emilia in northern Italy, a Russian grandmaster condescendingly told me I could at best be a coffee-house player because I had not been tutored in the Soviet school of chess, which then dominated the sport. With the arrogance of youth — I was 21 — I thought to myself, "But didn't we Indians invent chess? Why shouldn't I have my own route to the top of the sport?" 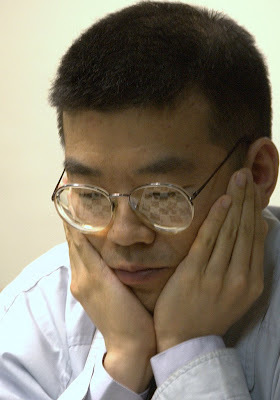 It would take me 17 years to find that route, and along the way I've had hundreds of conversations about the origins of chess — with players, fans, officials, taxi drivers, barbers and who knows how many people who sat next to me on a plane. I've heard the ownership of chess being claimed by Russians, Chinese, Ukrainians, Arabs, Iranians, Turks, Spaniards and Greeks. My own view is that the sport belongs to everybody who plays it, but the question of its origins is easy enough to answer: chess comes from India. Our claim is based not on dominance — although the Indian school is now producing lots of high-quality players, including (ahem) the world No. 1. Some of the oldest references to the sport are found in ancient Indian texts. In the great epic Ramayana (which, according to some sources, was orally transmitted sometime between 750 B.C. and 500 B.C. ), the demon king Ravana invents chess to amuse his wife Mandodari. A brilliant mind, she promptly beats him at it. My grandmother told me that story when I first began to play the game at age 6. 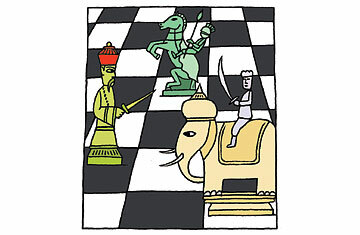 Chess also features in the Arthashastra (3rd century B.C. ), perhaps the world's oldest political treatise. Its author, Chanakya, describes chess as a game of war strategy, known as chaturanga, played on an 8-by-8 board. Think of it as the world's first virtual war game. I believe chess traveled westward out of India, through what is now Afghanistan into Persia, where it arrived during the Sassanid Empire — an Indian king is believed to have sent a chessboard as a gift to his Persian counterpart. At the royal court in Ctesiphon, the game was known as chatrang. The Arabs learned it (they called it shatranj) when they conquered Persia in the 6th century A.D. and carried it across northern Africa. They introduced the game to Europe when the Moors crossed the Mediterranean into the Iberian peninsula. It grew immensely popular in Moorish Spain, where it was played in the street — a practice still seen in parks and other squares in cities around the world. Iberia underwent a major change after the 15th century reconquista by Catholic forces led by Queen Isabella I — and chess changed, too. On the board, the queen became the most important piece; the bishop replaced the camel and flanked the king and queen. (Modern chess is still played by rules formalized under Isabella's reign.) Around this time, the Spanish player Luis RamÍrez de Lucena wrote what may have been the first book about chess theory — the Lucena Position remains to this day the cornerstone of rook and pawn endings. Ironically, Russia may have been one of the last places in the Old World to receive chess, likely through the Volga trade route. It became popular there during the reign of Peter the Great. The late introduction didn't stop the Russians from becoming the game's superpower, though, and it wasn't until 2000 that an Indian — yours truly — finally brought the title of world chess champion back to the land of the sport's birth. I like to think that the arc of my own career has in some ways mirrored the journey of chess. 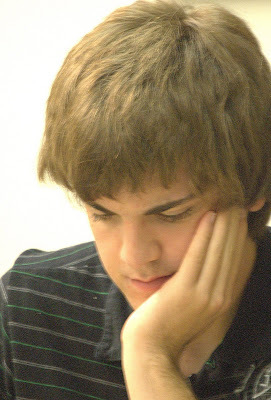 I learned to play in India, then moved to Spain so I could play the European circuit, and won my first world championship in Iran. It's nice when your place in chess history has something to do with the bigger picture. CHESS; Iranian or Indian Invention? Iran 7th to 8th c.
(fig. 10) Jami's 15th century Persian manuscript of Haft Awrang depicting two Persian chess players. Chess is one of humanities popular pastimes and has been described not only as a game, but also as an art, a science and a sport. Chess is sometimes seen as an abstract war-game – as a ‘mental martial art’ – and teaching and playing chess have been advocated as a way of enhancing mental prowess. It is very unlikely that Chess, almost as it is played today, suddenly came into existence or invented by one person. The idea of it being a combination of elements from other board-games has merit. Since almost all known board games have religious backgrounds the astrological component is entirely possible, even though one prefers the version that all elements come from other games, as the basis for the counters. Iran as the area of origin is highly possible, especially because of the two excavated debated pieces from the second century CE, which were found in the area of the Iranian cultural realm. However, "chess is an ancient game which is first mentioned in documents dating back to the early years of the seventh century A.D. and associated with North West India and Persia. Before the seventh century of our era, the existence of chess in any land is not demonstrable by a single shred of contemporary evidence" (Fiske, the Nation). Various scholars have proposed various origins for chess: Bidev states that “chess comes from China”, while Samsin suggests that there was hybridisation of Eastern and Western games in the post Alexander kingdom of Bactria in c180-50BCE. Josten is geographically between the two of them, favouring the Kushan empire in ca. 50BCE – 200CE. Various names have been, and are now, used for chess-like games. Chaturanga, for example, is a chess-like game, but it is played on an eight by eight board (rather than the modern chess twelve by twelve board) and it uses slightly different pieces and rules to those in the modern game. 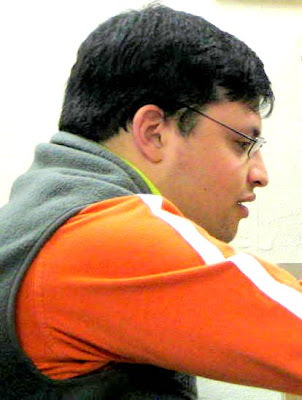 It has been suggested to be a proto-game for chess, of Indian origin. The word chaturanga means ‘quadripartite’ or ‘army’. This reflects the four components in Vedic army platoons, which are themselves reflected in the types of pieces used in the game. Ricardo Calvo notes that the first unmistakeable reference to the game of chaturanga is in the Harschascharita by the court poet Bina, writing between 625 and 640CE. 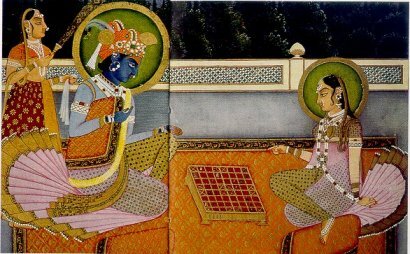 The word’s early literary use and its origin in the ancient language of Sanskrit have been suggested to provide supporting evidence for the Indian origin of chess. Murray specifically suggested that the Pahlavi word chatrang – used for a game equivalent to the current chess – was derived from chaturanga. However, one of the most etymological evidences can be identified in the terminology of chess pieces which are Persian such as Rook. 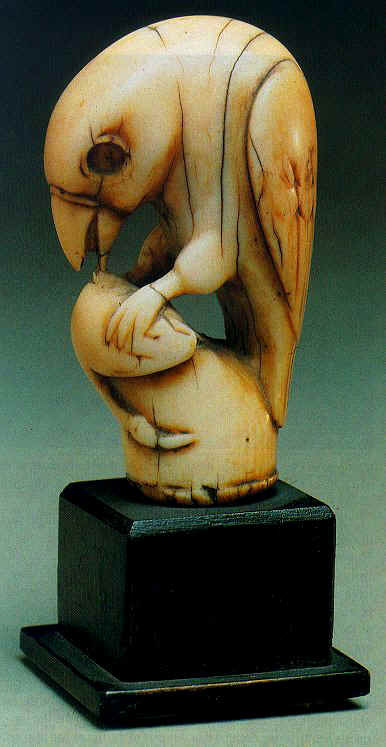 Rook which is a Western derivative of Rukh is another term for Iranian mythical bird Sên-Murv (Persian) Simurgh. In Irnaian literature (Avestan) Sên-Murv identified as Homâ and in Arabic introduced as Rukh. The Simurgh or Rukh, was depicted as a winged gigantic creature in the shape of a bird, that could carry an elephant or a camel. The functionality of the Rook piece in game of chess and its iconography in Iranian world is quite significant. The bird which Iranian believed imparted fertility to the land and the union between the earth and the sky. In India, the piece is more popularly called haathi, meaning "elephant". Another hint is the nomenclature of the pieces, persistently related to different sorts of animals rather than to components of an army: In the "Grande Acedrex" of King Alfonso of Castile (1283) lions, crocodiles, giraffes etc. play over a board of 12x12 cases with peculiar jumping moves, and the invention of it is connected to the same remote period in India as normal chess. They are very atypical in any context referring to India (De Gruyter, p.). Other chess terminologies are also deeply rooted in Persian language, such as “checkmate” (the English rendition of shāh māt, which is Persian for "the king is frozen") as well as “bishop” and “queen” pieces. 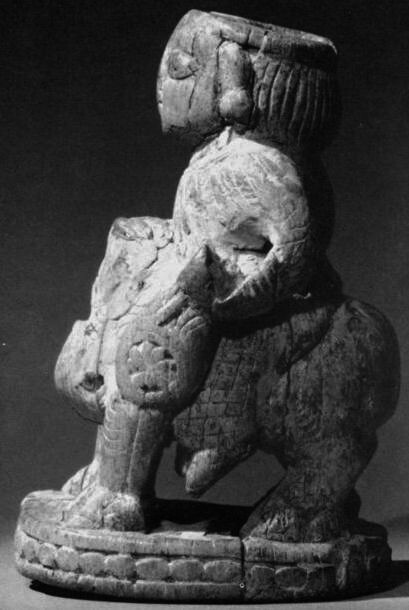 "Bishop" chess piece which is a western innovation, derived from the elephant, most likely in the 15th century - it is from the Persian pīl meaning "the elephant". In Europe and the western part of the Islamic world people knew little or nothing about elephants, and the name of the chessman entered Western Europe as Latin alfinus and similar, a word with no other meaning. This word "alfil" is in fact is an Arabic loanword from Persian pīl < fil , and in turn the Spanish word alfil would most certainly have been taken from Arabic. Chess was introduced into Spain by Ali ibn-Nafi the famous Persian poet, musician and singer (also known as Zaryāb or Ziryab, “gold finder”) in the 9th century – it is described in a famous Libro de los juegos the 13th century manuscript covering chess, backgammon, and dice. Some argue that since one of the pieces are being referred to as "elephant", must of an Indian origin - on the other hand, elephants are not at all exclusive to India (Gowers, p.173 ff; Walbank, p. 205-6.). However, Iranians were the first nation that introduced cavalry and they had also foot-soldiers, chariots and elephants as well as river and battle-ships. In Egypt, the Ptolemaic Kings obtained elephants regularly from Somalia. Strabo (16,4,5) mentions the foundation of several cities in Africa with the main purpose of hunting elephants (Gowers, p.173 ff; Walbank, p. 205-6.). The English name "bishop" is a rename inspired by the conventional shape of the piece. The chess piece known as "queen" is (Persian) farzīn also vizier. It became (Arabic) firzān, which entered western European languages as forms such as alfferza, fers, etc – then later it was replaced by "queen" - possibly brought to West by British during the British rule of India; aince the Indian equivalent of "queen" is rani. The "Karnamak-ī Ardeshīr-ī Pāpakān" (the Book of Deeds of Ardeshir-e Pāpakān), an epical treatise about the founder of Sasanian dynasty, mentions the game of "chatrang" as one of the cultural accomplishments of the Ardeshir as a young prince. It has a proving force that a game under this name was popular in the period of redaction of the text, supposedly during the reign of Khosrow II, Parviz (r. 590-628 CE) - the work could have been composed as early as 260 CE. The third and final Pahlavi text is known as Khūsraw ud Rēdag (Khosrow and the Page). It mentiones together with other games in chapter 15 of the (ud pad Čatrang ud new-ardaxšî r ud haštpay kardan az hamahlan fraztar hom "and in playing Chess, backgammon and the hashtpay, I am superior to my comrades" (Unvala, p. 16; Monchi-Zadeh, 1982, p. 65; Panaino, 1999, p. 51). 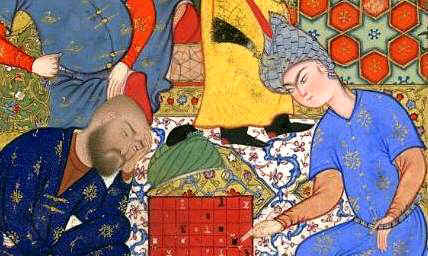 It seems the story was taken place at the court of Khosrow I, Anūshakrūwān (Immortal Soul - r. 488–531 CE) and states that chess is one of the cultural disciplines that a noble should learn. Ferdowsi the greatest of Iranian epic-poets wrote also about it in the 10th century, but his sources are solid and form a continuous chain of witnesses going back to the middle of the 6th Century in Iran. He describes chess as arriving from Hind. According to Iranian historical sources this name "Hind" was not used for India until after the 11th century. Here "Hind" means Eastern-Province of Iranian Empire including modern Sistan and Baluchistan, and while during the Achaemenid times it was extended to Khuzestan province. As Bidev, the Russian chess historian pointed out, nobody could possibly generate the rules of chess only by studying the array position at the beginning of a game. On the other hand, such an achievement might be made by looking at Takht-ī Nard (backgammon), which is another Iranian game-invention - the use of dice also favours its Iranian origin. The world oldest pair of dice was discovered in Dahān-e Gholāmān located in in southeastern Iranian province of Sistan, which date back to Achaemenid period (fig. 12.). The oldest clearly recognizable chessmen have been excavated in ancient Afrasiyab (ancient Samarkand), in Iranian cultural domains contrasts with the absence of such items in India. Afrasiab was under thy Islamic rule since 712, but were essential a Persianate land and society by origin. Some other old pieces, possibly Chess pieces, are the occasionally named chess pieces of an elephant and a zebu bull kept in Tashkent. They were excavated in 1972 at Dalverzin-Tepe (fig. 3), an ancient citadel now in Southern Uzbekistan, and stem from the 2nd century. 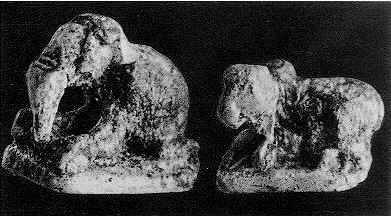 The Russian Chess history expert Linder feels that they are not Chess pieces, but belonged to a forerunner of Chess. They could mean an earlier than previously assumed existence of Chess. However, there are no chessmen there from early times in India, and only in the 10th century appears an indirect mention from al-Mas’udi: "The use of ivory (in India) is mainly directed to the carving of chess- and nard pieces". Some experts believe that old Indian chess pieces may be discovered one day! So far, this is mere speculation. Next group of chess pieces (three chessmen) comes from. In Nishapur (fig. 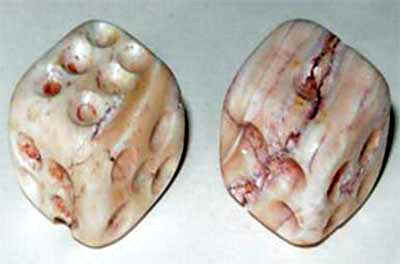 6) another ivory set was discovered though belonging to later times, 9th or 10th century. These are not idols anymore and are carved following the abstract pattern which has been characterized as "Arabic". Games upon the "ashtapada" board of 8x8, with dice and with two or more players may have served as "proto-chess", but the two types of games already differ too strongly in their nature and philosophy to make the evolution of "Chaturanga" into "Shatransh" a simple question of direct parentage via the Persian "Chatrang". Muslim writers stated quite frequently that they took the game of "shatranj/sh" from the Iranians, who called it "chatrang". This happens in the middle of a political-cultural revolution, which has been analysed in historical texts. The ruling Umayyad dynasty was overthrown by a certain Abul-Abbas, who initiated a new era around the year 750 - transferring the Islamic political centre from Damascus to former Iranian territory and Baghdad, which still was under Iranian cultural influence. The Abbasid dynasty was culturally and quasi ethnically of Iranian origin - so Iranian dominance became clearly the focal point in the cultural renaissance which took place inside the Arabic trunk. Large number of the previous knowledge from ancient Iran, Greece, Byzantium, Egyptian and Middle East civilizations was compiled and translated into Arabic. The new information absorbed in a scientific body which followed its further path towards the West. Chess was only a part of this knowledge, packaged together with earlier mathematical, astronomical, philosophical or medical achievements. J. M. Unvala, The Pahlavi Text "King Husrav and his Boy," published with its Transcription, translation and copious notes, Paris, n.d.
De Gruyter, "Hasb" in The Encyclopaedia of Islam, Leyden-New York (1967). William Gowers, "African Elephants and Ancient Authors", African Affairs, 47 (1948) p.173 ff. Frank W. Walbank, "Die Hellenistische Welt", DTV 1983 p. 205-6. D. Monchi-Zadeh, "Xus-rôv i Kavâtân ut Rêtak," in Monumentum Georg Morgenstierne, vol. II. Acta Iranica 22, Leiden, 1982, pp. 47-91. Panaino, A., La novella degli Scacchi e della Tavola Reale. Un'antica fonte orientale sui due gixochi da tavoliere piuà diffusi nel mondo euroasiatico tra Tardoantico e Medioevo e sulla loro simbologia militare e astrale. Testo pahlavi, traduzione e commento al Wiz-arišn î Chatrang ud nihišn î new-ardaxšî r "La spiegazione degli scacchi e la disposizione della tavola reale," Milano, 1999. 'Shapour Suren-Pahlav' is an Iranian Archaeologists, Iranologist and historian. He has studied his B.A. in Art and Archaeology, combined with ancient Iranian languages (Avestan and Middle Persian/Pahlavi), at the School of Oriental and African Studies (SOAS), University of London, under supervision of renowned British linguist, Professor Nicholas Sims-Williams. He then completed his M.A. in the Art and Archaeology, at the same university. He is specialized in the art and archaeology of pre-Islamic Iran. Suren-Pahlav, except his native tongues Persian and Zoroastrian-Dari, also speaks English, Italian and a working understanding of Arabic, Turkish and German. Suren-Pahlav is the co-founder of 'The Circle of Ancient Iranian Studies' (CAIS), and currently is the programme director of CAIS. At the last board meeting of the Boylston Chess Foundation, we voted on some changes to our Thursday Night Swiss format for July and August. Note: these will be updated on the website listing soon. Lawyer Times demonstrated why one should never count out masters who may temporarily dip below 2200-- He won the Wed Night Quick Quad with 2.5. Scroll ahead and you will see Lawyer's name a bunch this month. 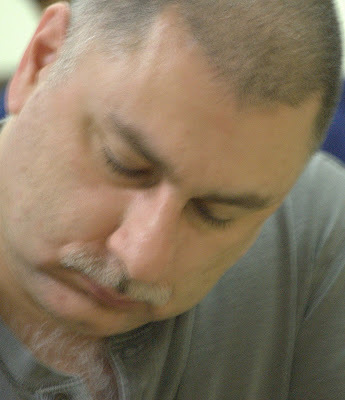 IM David Vigorito had been scarcely seen at the Boylston Chess Club since March, but he returned to the top by wiping up the sparsely attended June 14th Open with a 4.0 score. Lawyer Times took clear 2nd with a 3.0 score, including a win over master Chris Chase. IM Vigorito and master Lawyer Times shared first place with a 2.0 score in a strong all master quad. Carey Theil took first in the other section, a swiss of 6 players. Lawyer Times, clearly in sharp form, went 4.0 over a strong field that included three masters and six experts. Lawyer has now taken 1st or 2nd in the last four BCF events. YOU should stop by for the upcoming Wed., Thursday, or weekend club events. Can YOU unseat Lawyer's run of top finishes? Lyman, Chess Team Need Funds for World Tourney Sweden Bound? Travel expenses of $2500 are needed if Shelby Lyman '59 and three other American college chess players are going to enter the third World Student Chess Championships at Upsala, Sweden, next month. Lyman, however, on contacting the Dept. of Athletics, was told that no funds were available for chess. The only contribution from Harvard so far is a small donation for the Chess Club. Half of the necessary sum has been pledged and the colleges attended by the other three members of the team have managed to raise nearly $1000 between them, leaving a small gap before the goal is reached. The sponsors of the team the Intercollegiate Chess League, had counted on the University to fill the gap. "Sports Illustrated" has called Lyman a "brilliant but uneven player who has a disconcerting habit of jumping up after he has made a move, as though he had to catch a train." 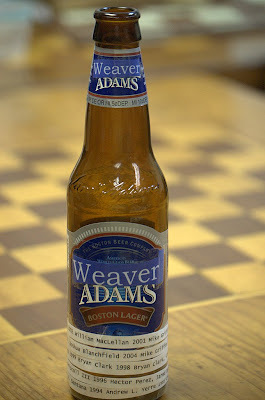 He comes from a Dorchester family that is famous for defeating world masters when they come to Boston on tour. 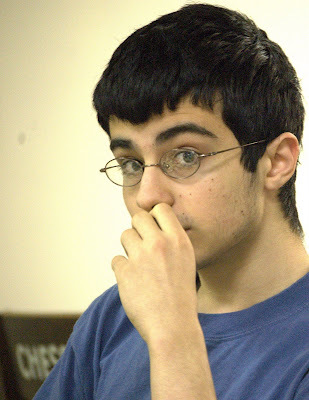 Lyman is one of the top players at the Boylston Chess Club in Boston and has played for the Club in its matches with rival chess clubs throughout the country. This marks the first time that a team from the United States has entered the tournament, the Olympics of chess. The meet is sponsored by the International Students Association, a communist organization, with the Swedish Chess Federation and the International Chess Federation as co-sponsors. Teams from fifteen nations will compete in the Championships, including several from countries behind the Iron Curtain, led by the defending champions from the Soviet Union. Other nations represented will include Hungary, Rumania, East and West Germany, Czechoslovakia, and the Netherlands. Trophies to top two in each section . In the mid 70's I poured over all the Boris Spassky's games I could find, and noticed the repeating pattern with white used by Spassky when using his dark squared (king side) Bishop. This bishop would eventually get on the c2-h7 diagonal and deliver the knock out. In the Ruy it would travel from f1 to b5, to a4, to c2. And somehow whether the opening was Queen's Gambit, or Torre, or whatever, this bishop, many times in coordination with the Queen, would slide into his killing field. This got me to describing any bishop on, or destined to be on, the c2-h7 diagonal as "the Spassky bishop". This got me to nicknaming specially applied roles that a piece might be executing: another term I coined was the "Bismarck Queen". This is a queen that strikes out alone, usually into the wide Pacific of the queenside to go raiding unescorted pawns. Usually while I'm defending an attack on my kingside, taking the risk that my king is the extra piece that will help in defending enough. Then there is the "Botvinnik Queen", she sits on c7 anchoring a French defense. The "Fischer Bishop" with white on c4. The "Lasker Rook" is lifted somewhere to the middle of the board earlier than most would ever consider such a move. The "Steinitz bishop" mysteriously moves backwards to the first rank. The "Duncan Suttles Knight" first moves to the a or h file and then hops to the second or seventh depending on the color , typically the f file,. Could also be called the "Didham Knight". "Ivanov Pawns": it's amazing how often Ivanov gets hanging pawns on the sixth and seventh ranks. The "Dondis Pawn": Harold is ever attentive of, and is really tough, when he manages to have a little fellow streaking up the board to the finish line. Can you think of other special named pieces? We are sorry to say we just learned that Ed Lafferty died from lung cancer last Thursday. EveryDay Ed will not be here at today's BCF tourney. Ed Lafferty arrived just in time to enter St Peter's Open. Being new he was paired to face Bobby Fischer on board one. Ed with black defeated Bobby with his Philidor defense in 56 moves. Everyone in heaven has a 3300 rating, the same theoretical understanding, and due to a special ruling allowing for imperfection, games can be won, lost, or drawn. Every game played is the greatest to that point in time. Jack Martin bestowed the name "EveryDay Ed" because there was a time when if there was a chess tournament in Eastern Mass, Ed was there. Edward Lafferty played in so many tournaments that in the years that the Mass Grand Prix contest was in play Ed was a frontrunner. The Ivanov's and Curdo's got 80% positive results but Ed had to earn every point one at a time. Still he was always in the lead pack. Ed had a period in his life when he howled at the moon; chess was one of the things that gave him stability, motivation, and joy in a sometimes difficult life. Ed and I share June 23 as our birthday although Ed was born in 1957 (myself in 1952). He got great joy when we wished each other a happy birthday. Ed having been a varsity soccer player for U Mass Amherst (and a chemistry major), I unknowingly saw him play in the 70's against my Westfield State several times. About five years back Ed played a memorable game against Alexander Paphitis where, from a position that looked like all the pieces were shot gunned onto the board in a random type of chess, Ed reeled combination after combination off to destroy Alexander's position. Definitely one of Ed's best. Until we meet again EveryDay, Safe Journey. 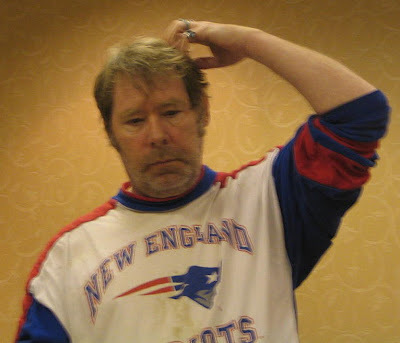 51, of Waltham, formerly of Newton, died on June 5, 2008. He was the beloved son of Edward L. and Margot A. (Footer) Lafferty. Devoted brother of Michael J. Lafferty, and his wife Alcira, and Jeffrey P. Lafferty and his wife Celia. Loving uncle of Julia, Patrick, Rebecca, and Emily Lafferty. He worked at the Fessenden School, where he had many friends, and also spent many happy hours at the Elliot House. 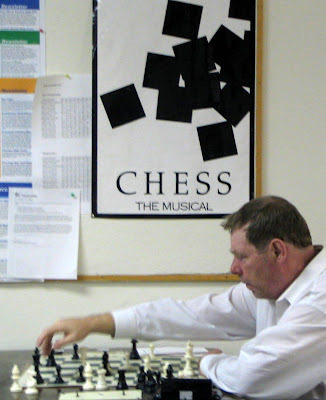 A member of the Boston Chess Club, he enjoyed playing chess and participated in many national tournaments. A Mass of Christian Burial was celebrated on Monday, June 9, at 10:30 AM in Mary Immaculate of Lourdes Church, 270 Elliot Street, Newton. A visitation as held on Sunday, June 8, from 2-4 PM at J. S. Waterman & Sons-Waring Funeral Service, 592 Washington Street, WELLESLEY. Interment was private in Newton Cemetery, Newton. American Cancer Society, P.O. Box 22718, Oklahoma City, OK 73123-1718. Published in the Boston Globe on 6/7/2008. Lots of action at the chess club! A new Chris is dominating the winner's circle this past month. Expert Andrew Tichenor grabbed first place in the Rapid quad turned swiss. Chris Chase scored an impressive 3.5 over a field that included SEVEN masters. His only draw was against Bill Kelleher, who shared second with masters Chris Williams and Eric Godin. As we shall see, Chris Williams doesn't stay in second place for long. Zaroug Jaleel improved 60 rating points in one event with his 4.0 sweep of the pretty evenly matched Thursday Night field. He puts himself in position to make the climb to expert now. 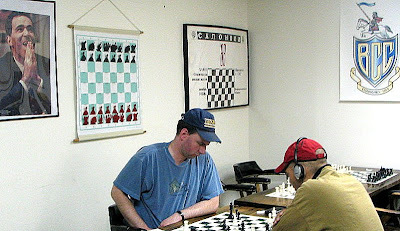 The now weekly Wednesday Night rapid quads are a breeding ground for some fun but crazy chess. Three rated games in an evening is not to be missed! Chris Williams took the pole position over Chris Chase in the top quad, while Adam Yedidia won the 2nd quad with 2.5 out of 3. Is this the start of the reign of Chris the Second, or just a temporary blip in the BCC status quo? Another strong field of 4 masters and 5 experts showed up. Chris Williams, honing his skills on the Rapid Quads, went 4.0 to take clear first place. Chris Williams took the top quad with 2.5. In the second quad, Seth Lieberman improved 90(!) rating points with his 3.0 win over the field. I had mentioned Seth's rapid improvement last month, but this, combined with his win in the quads (see below), now put him over 1600. Great improvement Seth! This reporter remembers his lucky last minute escape against Seth in their last encounter, so I suspect 1600 is only a rest stop on the way to even more improvement. Chris Williams claimed first with 2.5/3. Embert Lin took the second quad. Adam Yedidia beat the 3rd quad, and Seth Lieberman broke the 1600 barrier with a victory in the 4th quad. If you attended these events, please share your personal notes and observations in the comment section.